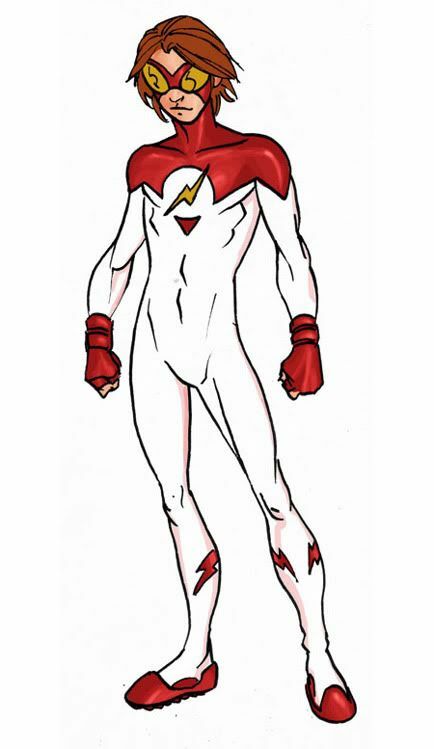 Note: This week’s Bart Allen (aka Impulse aka Kid Flash aka The Flash) redesigns are presented in honor of the character’s co-creator, artist Mike Wieringo, who passed away on August 12th. More info here and here. Joel: I keep thinking that this is the Impulse that would appear in the super-hero equivalent of Teen Beat. He’s so stylish and suave for a kid! I can imagine the DCU’s population of twelve-year-old girls swooning over his picture, and writing “Impulse+Mary Sue=Tru Luv 4evah!! !” on their notebooks. Or am I projecting? Jessica : Coming from a girl who is still secretly twelve years old at heart, I can say that you are definitely not projecting. This Bart is totally swoonworthy. Dean: Hahaha, awesome. I mostly wanted Bart to look like a sprinter waiting to race between missions, so I gave him the jacket. I also ditched the mask in favor of simple shades. I figured Wally worked best with the semi-open secret identity, and so could Bart. Vito : I want that jacket ASAP! Dean: I’m freaking floored by Tom’s design. Slick translucent helmet, gorgeous super-sized logo, wicked forearm lightning bolts, and cool boots all add up to a killer design…I want to draw this so bad. I think the vibe Tom was going for here is ‘armored,’ like the costume is tough leather and the helmet is an obvious necessity for crime-battlin’. I love it. Joel: Whoa! I love that helmet design! That is very cool. The enlarged chest emblem is bold, and works well in this design. Are those rivets along his waist? I’m guessing that the lightning motif is asymmetrical on the legs, but I can’t really tell. Vito: The thing that strikes me is that this looks like a kid. He looks like he’s having fun, and that is what Impulse is all about. 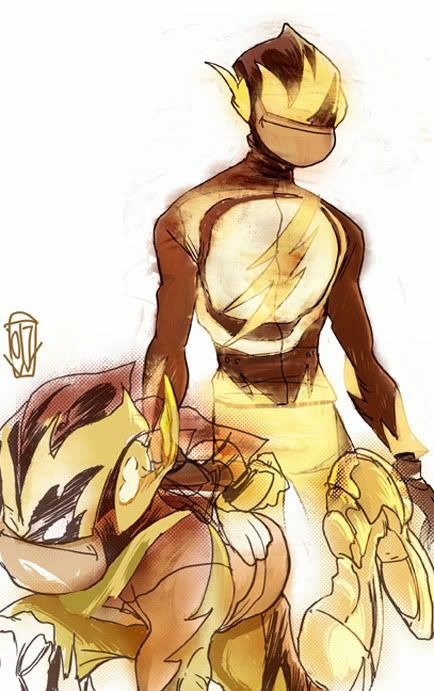 The way that top half meets the bottom half…this could easily have been a Kid Flash redesign. I also like how bold and large that chest emblem is. If you look at this closely, and use a little imagination, when he runs, you’ll get the lightning effect that we always see. He wouldn’t need the Speed Force to represent itself as lightning, because the costume, with the yellow lightning motif, would do it for him. Jessica: There’s something very super-soldier about this – I’m picturing an army of Bart’s clone “scouts” (remember those?) in this design. What a visual punch! Joel: This is a very strong design, and one that makes good use of Bart’s history as Impulse to bring new visual motifs into play. The unbroken expanse of white provides a streamlined look. I really like the dropped-out circle for the chest emblem. I’m not sure how I feel about the distinct slant given to the goggle lenses. On the one hand, it makes Kid Flash look a bit insecty. On the other, it makes Kid Flash look like he’s trying to take himself more seriously than the wide-eyes, round-goggled Impulse, which strikes me as appropriate as the character ages. Dean: Mike’s design looks made to move!. Great windswept hairstyle, cool treads, functional googles, and the red-on-white lightning bolts on the calves are wicked. I also like how Mike kept Bart’s original ‘Ringo-designed gloves. Vito: If Bart ever joined his cousin XS in the Legion, this would be the perfect costume for him, hands down. Chris: Amazing. I can’t find a single thing wrong with this, when it’s all soo right. Vito: [praying] Dear Jesus, please let DC do a Kid Flash story within the 52 Earths and have Mike Norton draw it. Thanks and Amen. Hey Dean Trippe, Zach Efron’s agent called. She wanted to hear if your Kid Flash was free to do a duet with Zach in High School Musical 3.
that tom williams design is awesome! 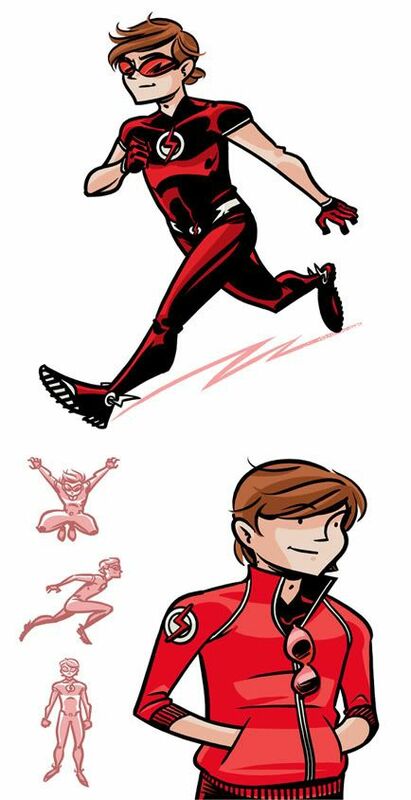 Dean Trippe’s Impulse design has my inner 12 year deeply confused about his sexuality. Thank you. I’d pay large sums of money just to see Tom Williams on a mainstream superhero book. The guy’s too good to just do corporate comics, but man, just to see the mayhem he’d unleash on the Marvel or DC universe would be worth the money. Disclaimer: I’m a friend and frequent collaborator of Tom’s. But that doesn’t mean I can’t be genuine in my gushing over his art. ADORE the Tom Williams design. Where can I find his stuff? Dean, your design is very reminiscent of the Smallville impulse design. Not that it’s a bad thing. I think it works very well.